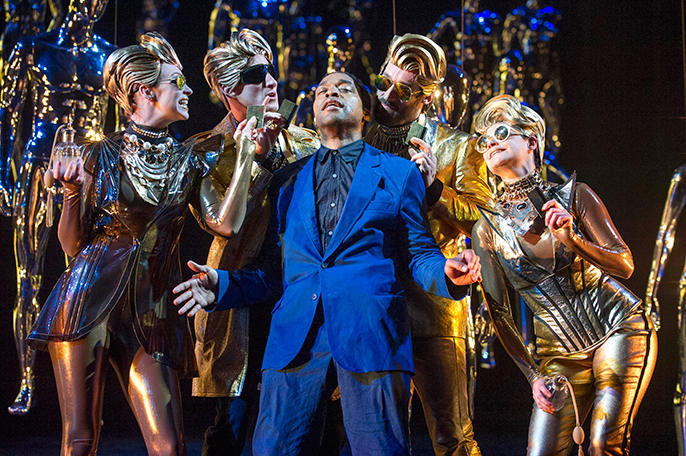 With powerful and striking stage imagery the audience is taken on an unstoppable ride”. 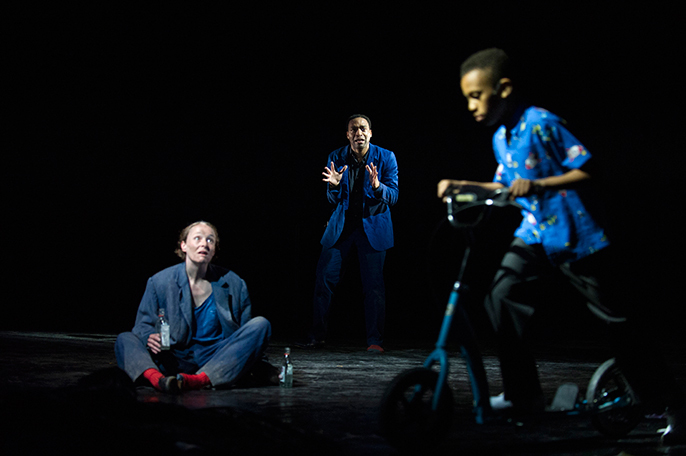 Everyman was first written in Medieval times and has been adapted for the modern age by renowned poet and playwright, Carol Ann Duffy for the National Theatre, which is no mean feat. This story has been retold in various forms throughout the ages both internationally and nationally. Headlined by Chiwetel Ejiofor this adaptation was set to pack a punch. The play is opened by the presence of God Herself in all her ironic glory on stage, played by Kate Duchêne, God introduced the religious undertones felt throughout the play. The simplicity of the human race’s inability to just be good and do good in life is perfectly summarised through God’s frustrations, her angst and her subsequent focus on Everyman throughout the course of his journey from life to death. We are introduced to Everyman (Chiwetel Ejiofor) in the midst of pleasure and debauchery, the essence of what many people seek from life; the temporary thrill of a party, of a good time whilst it lasts. In many ways we treat life as a party, a temporary high looking for gifts and affirmations from friendships that are often fleeting and yet do we ever ask what the party is for? This was just one of the questions raised throughout Everyman’s journey through purgatory. He could not escape the clutches of Death, whose deference to the will of God was unshakeable; played with gusto and wit by Dermot Crowley one could not help but warm to Death, his presence was one of life’s rare constants, our relationship with him is inevitable after all. 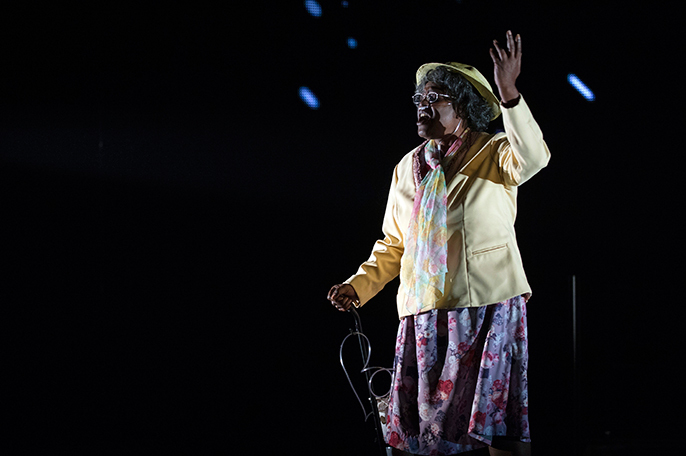 Everyman desperately sought atonement from his family; his sister (Michelle Butterly), father (Philip Martin Brown) and mother (Sharon D Clarke) each added balance and a dose of reality to Everyman’s journey in a way that his circle of friends and lover could not. Everyman represents all of the internal struggles that we must contend with when we evaluate our lives with or without the shadow of Death cast over us”. With powerful and striking stage imagery the audience is taken on an unstoppable ride. Whilst empathising with his struggles, one cannot not feel the compassion or sorrow that one would normally feel for a dying protagonist; why? It is quite simple, and humanly selfish, it is because Everyman is a reflection of us all. He represents all of the internal struggles that we must contend with when we evaluate our lives with or without the shadow of Death cast over us. The search for our purpose is very often only ever half complete, for when we feel that we have achieved some form of superficial success and acceptance by our peers we stop when in fact we should seek to go further. Something that “Knowledge”, played superbly by Penny Layden, brought to the forefront of Everyman’s quest. The morally dubious soul-searching undertaken in Everyman’s final moments are handled poignantly throughout the play with a bold and daring stage design and fitting musical score. The morally dubious soul-searching undertaken in Everyman’s final moments are handled poignantly throughout the play with a bold and daring stage design and fitting musical score. I was impressed by the use of space, textures, design and digital media throughout the play. 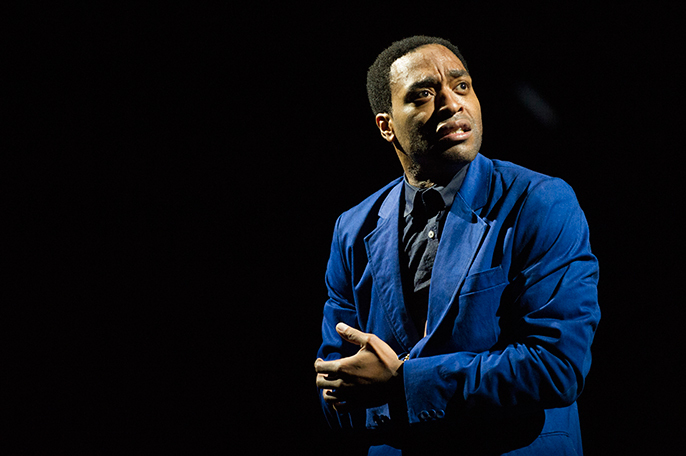 The standout of the production was of course Ejiofor, it goes without saying that his performance was formidable if at times overwhelming. I hope that audience members left the play meditating on the nuances presented throughout the play; understanding that religiosity is no indicator of goodness and in the same way that materialism is no true reflection of wealth. I recommend that you go to see this play and learn from it, take something away from your experience, you will not regret it.